Fine time for squalls and rain! The first rain we’ve had in 6 months, since we’ve been in Mexico and it poured down last night for a couple of hours. The wind howled in the rigging and the boat heeled as far as the dock lines allowed. The morning was cool and wet – very refreshing. We loved it! 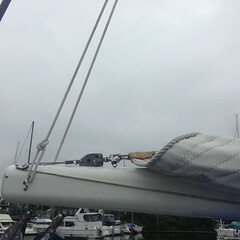 Helped us wash the boat but it also kept us from getting the dinghy and kayak stowed in the dry bags sooner. We also have 2 inflatable SUPs that need to be dry and stowed down below. 30 days of damp gear makes for a moldy stinky mess on our bed. We’re counting down the hours to departure time. 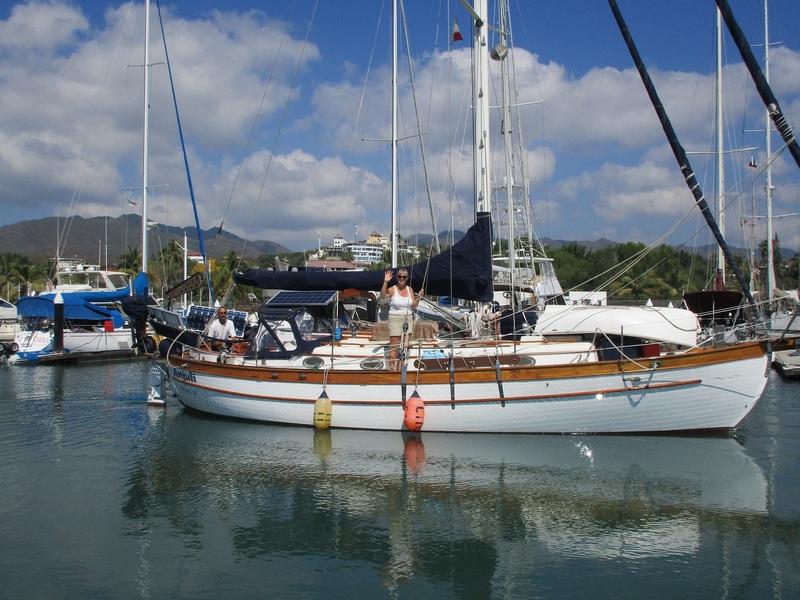 There is a new process in Mexico now, we have to motor to the Port Captain in Nuevo Vallarta at 10:30 a.m., about a two hour ride for a full boat inspection and they bring the dogs on board. Not sure if the dogs are looking for meat, alcohol, stowaways or perhaps it’s really drugs they’re after. As long as they don’t hike a leg on my deck, we’re good. I dropped off the last of the laundry and paid a hefty tip to get it back by 5:00 p.m., purchased enough meat to fill the 2.5 gallon freezer, 7 dozen eggs and bought all the fresh veggies and fruits that will last in newspaper wrapping. The canned food we’ll be eating for the next 25 days is stowed on the v- berth bed in baskets and bins for easy access. I don’t have a menu planned since we don’t know what the weather will bring. Sometimes cooking is easy and we’re starving, other times we just don’t eat due to rough conditions. Grab the peanut butter and crackers, boiled eggs or cheese. Lots of cruisers make meals in heat or go bags and store them in the refridgerator, that’s beyond me when I don’t feel like cooking or eating and right now, neither one of us feel hungry due to the anxiety level. We’re making our rounds on the docks this afternoon to say good bye to our boating friends we’ve made along the way, and checking in with the other Puddle Jumpers who are still prepping their boats. I believe we’re the first boat out of the La Cruz, kinda scary but pioneering is adventurous too! Most of the other PP Jumpers are departing next week after this cold front passes through. We have last minute electronic checks, emails, and boat system walk throughs. Top off the water tanks, showers and maybe by 9:00 p.m we’ll be ready to hit the sack, hope we can sleep! We have been planning for this moment since July 2009! 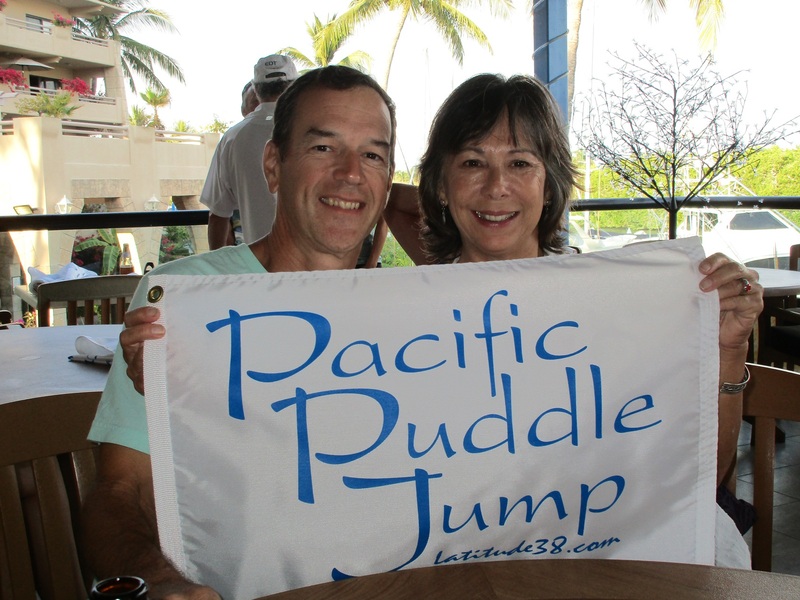 We can’t believe the day for departing on our grand adventure across the Pacific Ocean is here, Hip Hip Hooray! And we’re in an absolute state of frenzy!! No other way to state it, boat life is crazy right now getting the little details done before we jump. 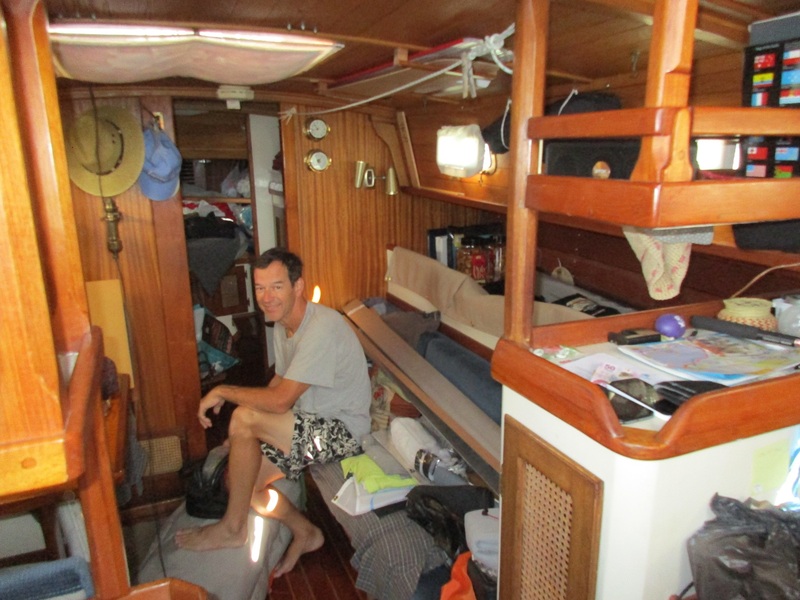 We have been working on the boat completing rigging projects, sewing sun covers and dinghy chaps, lee cloths, provisioning, researching the French Polynesia digs, making Google earth charts, filling out forms, updating our DeLorme satellite tracker to include other PPJ boats, watching the weather, and having our sundowners for the last 3 weeks. There are other things also, too many to list here. 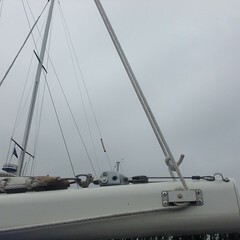 All those rigging projects weren’t on the list when we left, it’s when we got out onto the ocean and realized the Yankee furler line needs a rope clutch so I don’t lose control of the line, the mast needs another cleat, the preventer system isn’t adequate, the reefing system had gouged the mast and broke 3 slugs so John started over on that one. We need the 4th solar panel wired and ready to go on deck for the crossing. The main sheet was an issue before we left Portland but we didn’t know what to do to make it better. Turn up the pressure and the solution came to light! 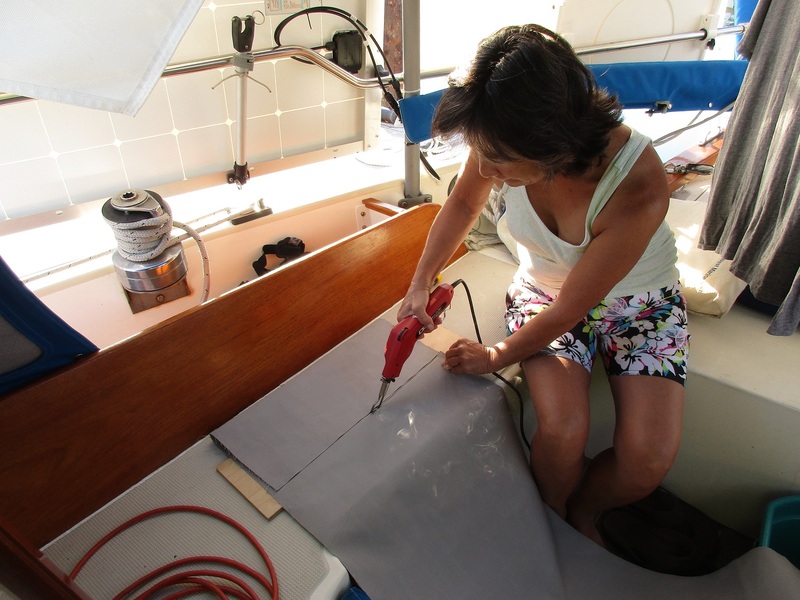 The dinghy cover was just fine, but we really needed dinghy chaps so I overhauled the cover. Swore, ranted and raved and whatdayaknow, we have chaps. Mighty fine ones, I might add. The provisioning brought bugs. Another damn cockroach was smashed. I miss the Portland cold rain and icy days, no cockroaches on the boat. 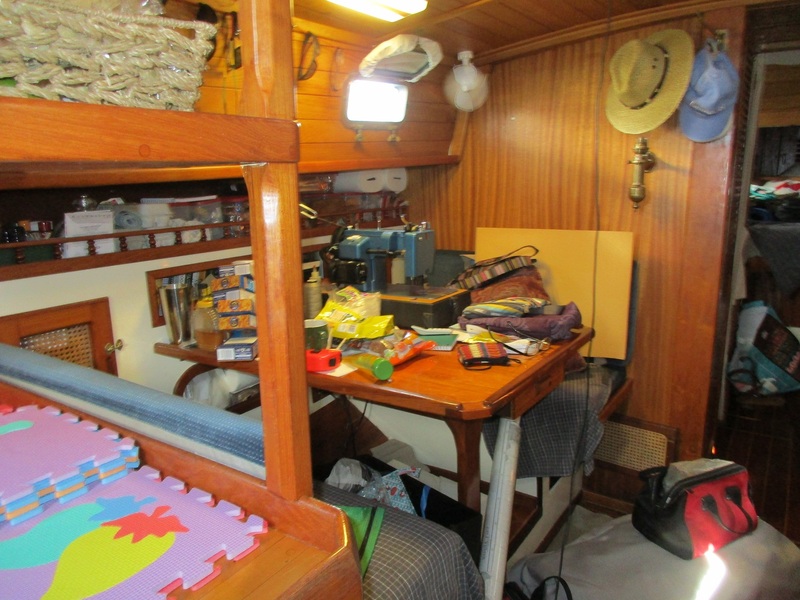 The boat was a disaster for a while but we managed to get it all stowed and the water line is no longer there. A guy came by one day and yelled “you’re going to have to repaint your waterline!” Really?, we hadn’t noticed. The air is saturated with ash and dust here in Mexico. I’m really looking forward to breathing clean air again on the ocean. 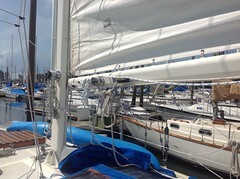 The halyards, sheets and canvas are black. 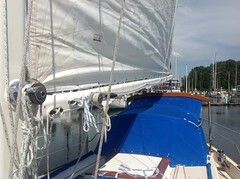 We spent nearly 2 hours today hosing down just the sun covers and canvas, the boat is still dirty. I found rust on the oven door because I haven’t been cooking or baking. It’s just too hot. Or maybe because I haven’t been paying attention to cleaning. Either way, I’ll be busy with stainless steel cleaner and polish on the inside and outside of the boat. So the best way to end the project list is to get out the scissors and cut it off! There you have it, ready or not, here we go! 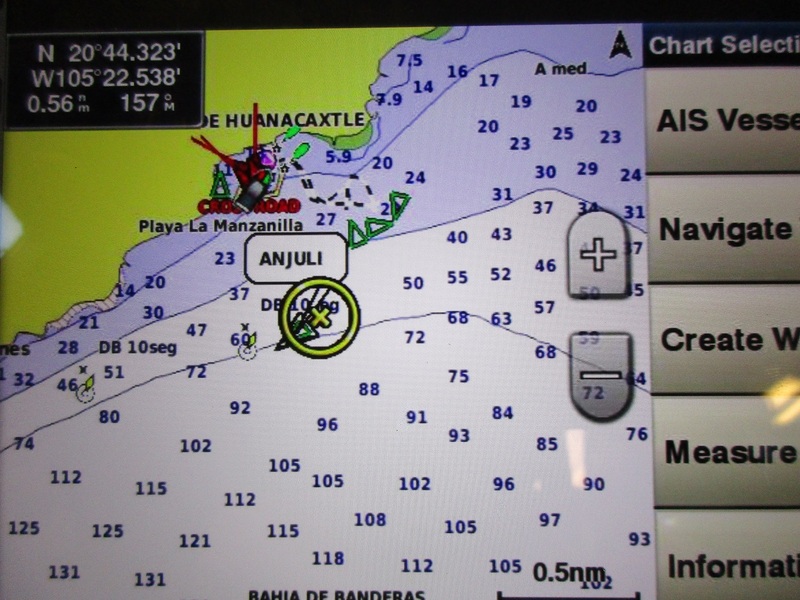 Dan and Tammy departed La Cruz a week ago, we tracked them on our chartplotter as they weighed anchor and motored out of the La Cruz anchorage. They are headed south to the Panama Canal and beyond. Having completed the So Pac loop back in 2005 we couldn’t convince them to go again as we prepare to head across the Pacific. Nearly 5 months ago we unexpectedly met off the Morro Bay, CA entrance. Standing off in the dark, we watched Anjuli on our chartplotter until morning light. As morning approached Tammy radioed us to go first through the breakwater into Morro Bay. Tammy has a very nice radio voice. 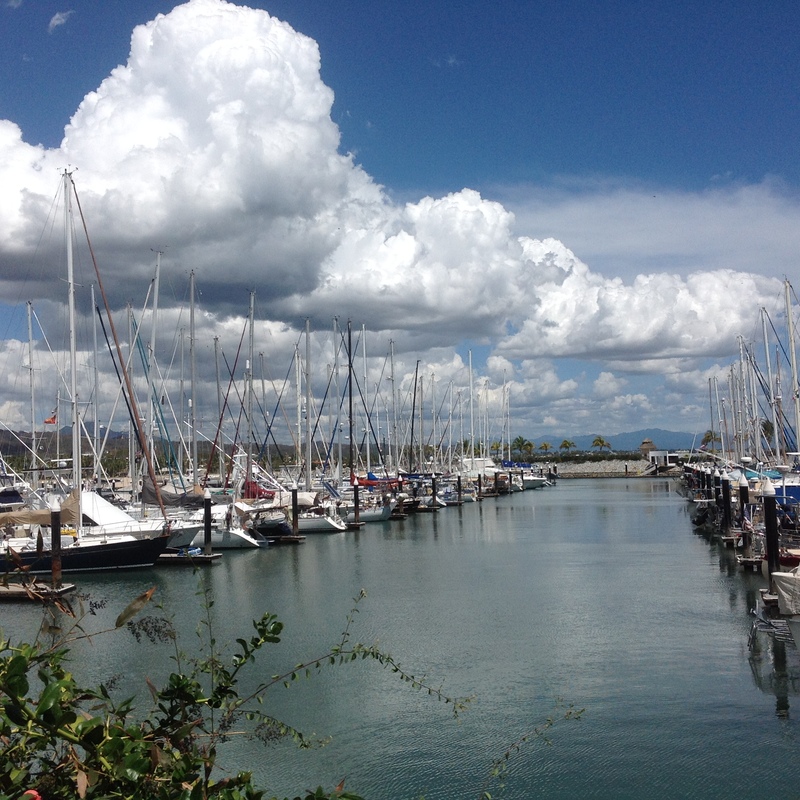 Dan steered Anjuli to the Morro Bay Yacht Club dock, and there was “Portland, OR” hailing port in big letters. We caught their dock lines, they stepped off the boat, we all shook hands, and that was the beginning of a great friendship. 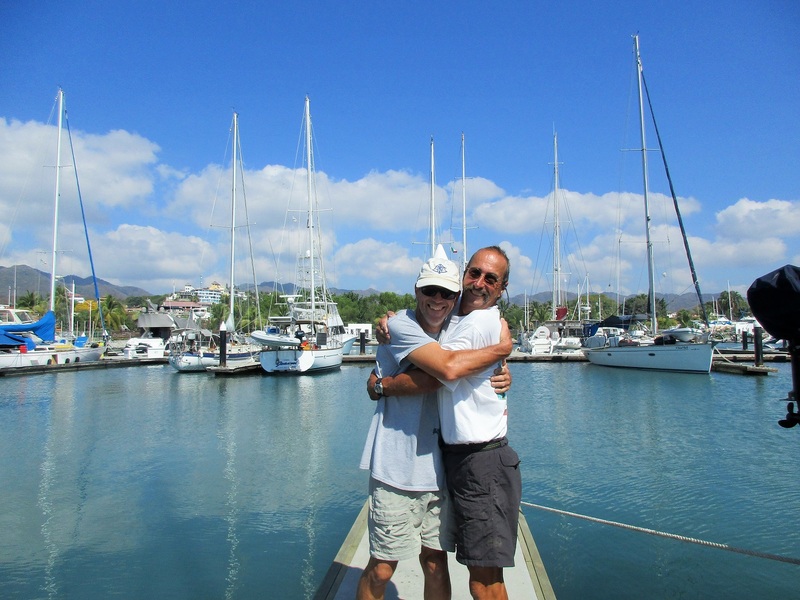 We buddy-boated for nearly 5 months, shared some awesome sea conditions, sailed in not so fun conditions, land travelled via train, danced in the Mazatlan streets, shared our fish stories, drank a lot of spirits , joked, laughed and had a fabulous time sailing from port to port, always together. We dearly miss them but since we’re both from Portland, we’ll be meeting up after our travels. Or,,, Dan will come to Mexico and install the air conditioning system in our Mexican home after we return from the South Pacific. Tammy and I will shop for colorful tiles, courtyard furniture and stone decorations. 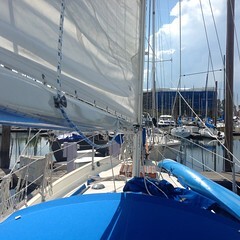 Safe travels and fair winds good friends! 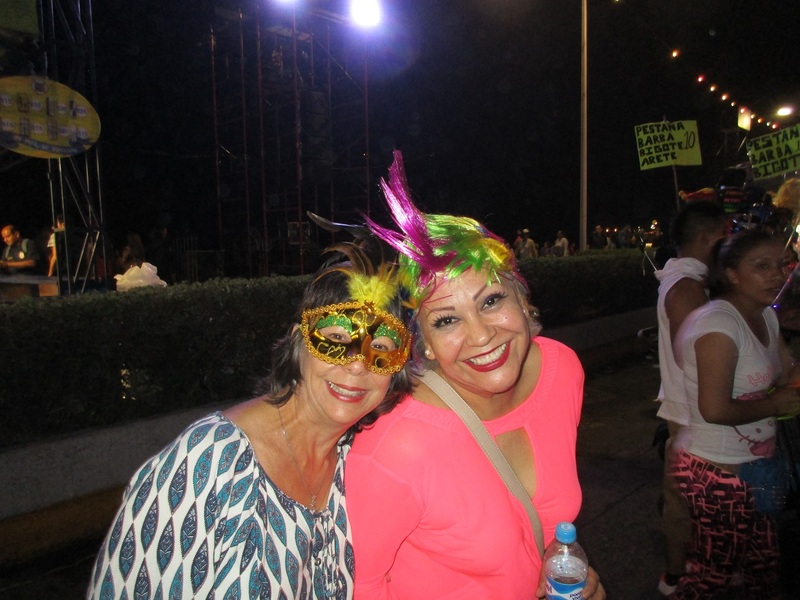 We back tracked to Mazatlán on Feb 5th, via an 8 hour bus ride – each way – to enjoy the Mazatlan Carnaval. 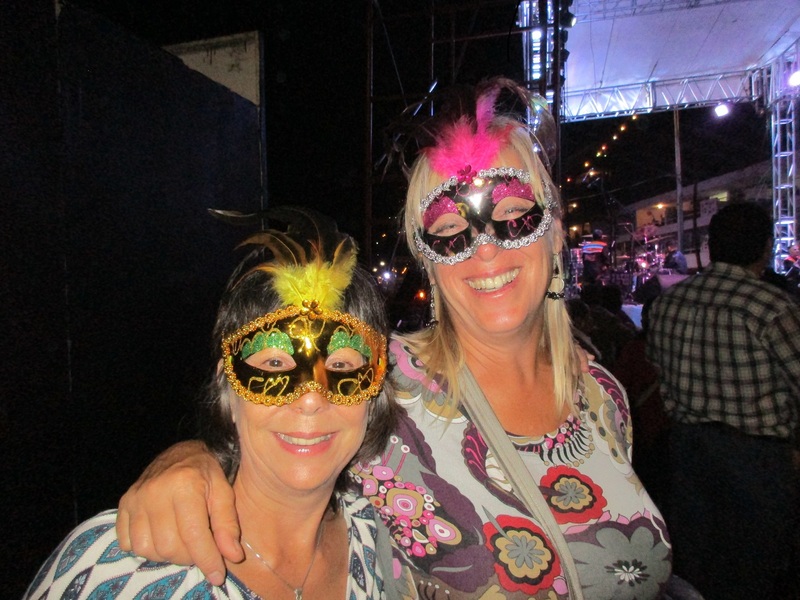 That was a fabulous ride through the country side and the Carnaval was a real kick. We managed to make reservations a few weeks ago for a nice hotel on the historic square where bands and street vendors started coming to life at 6:00 p.m. We met up with Dan and Tammy of SV Anjuli, met some new friends – Rob and Susan on SV Athanor – Seattle, Wash. and thoroughly enjoyed being a land tourist taking part in the festivities. 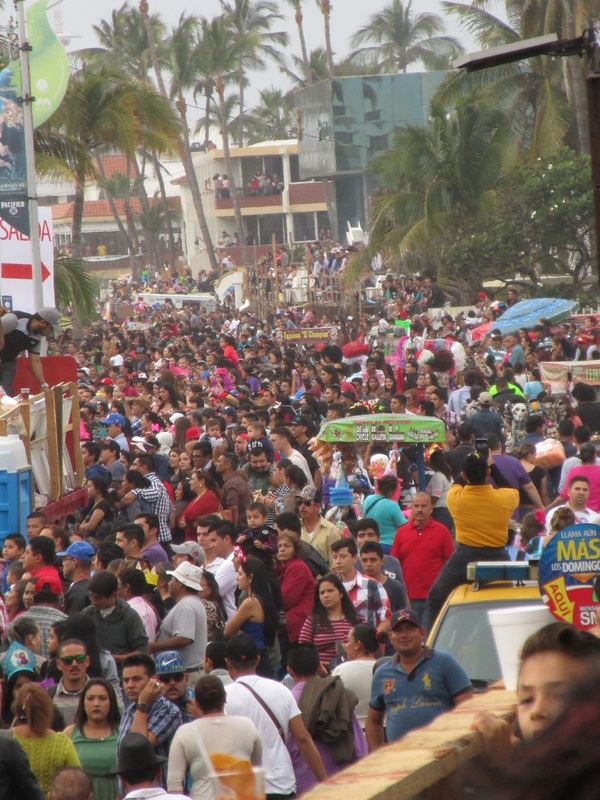 Six Bands on stages were set up spanning the 3 1/2 mile Olas Atlas malecon. 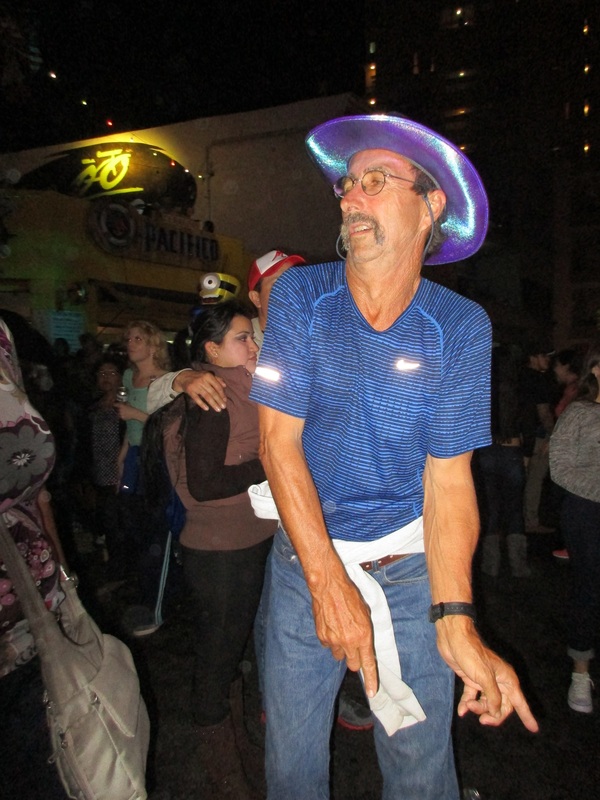 Latino, Mariachi, Jazz, and various Pop music blared as people of all ages danced shoulder to shoulder and shuffled from one band location to another. We danced with everybody, strangers and friends included. The restaurants, cart vendors and beer stands were packed as peopled waited for the Bad Mood Burning and firework events to start. 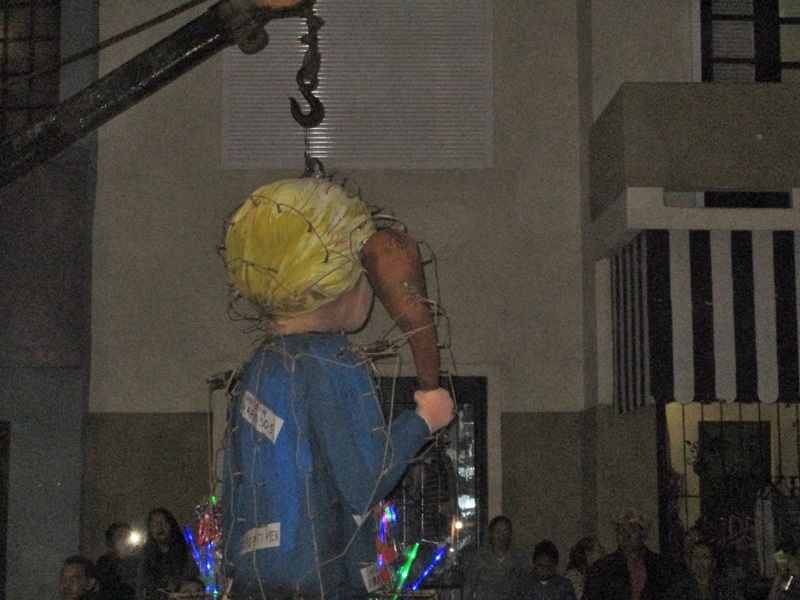 The traditional Carnaval ritual “Quema del Mal Humor (Bad Mood Burning) is the incineration of a giant puppet. It is generally modeled after an unpopular public figure, the effigy is hanged and burned, exploding like a massive piñata without the candy. This year was none other than – – – Donald Trump ! 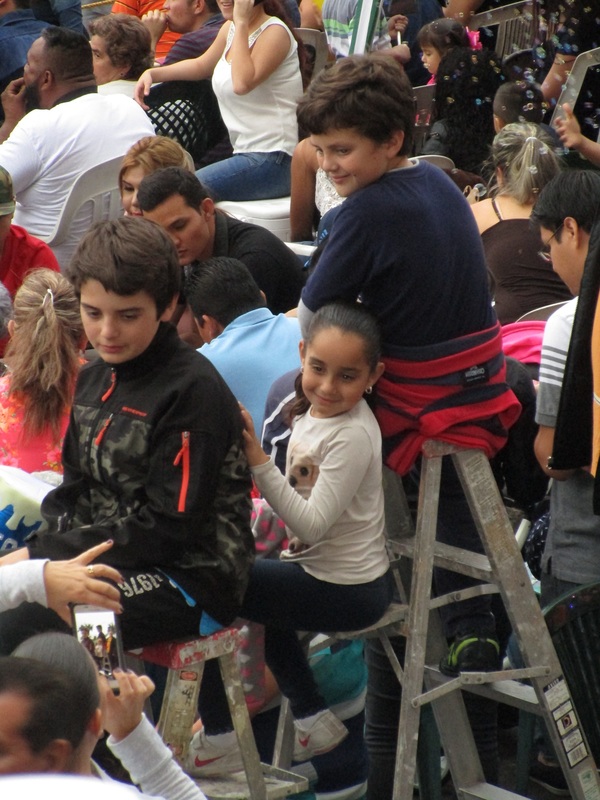 The crowds cheered and roared with laughter as Donald was motored down the malecon hoisted from a crane. The ‘Naval Battle’ fireworks display representing the battle with France was lit from the beach just over our heads, the raining ashes continued to burn as they floated toward us. Music and lights accompanied the fireworks to the impressive grand finale. No expense was spared there. We left after the fireworks, it was well after midnight as the younger generation crowds were just getting started in front of the band stages. Outside our hotel the crowds and bands lingered well after 4:00 a.m. At 5:00 a.m the cleanup crew with gas powered leafblowers started their engines blowing garbage and people away. For our 3 night stay this was the evening routine. The Grand Parade on Sunday afternoon started at 5:30. 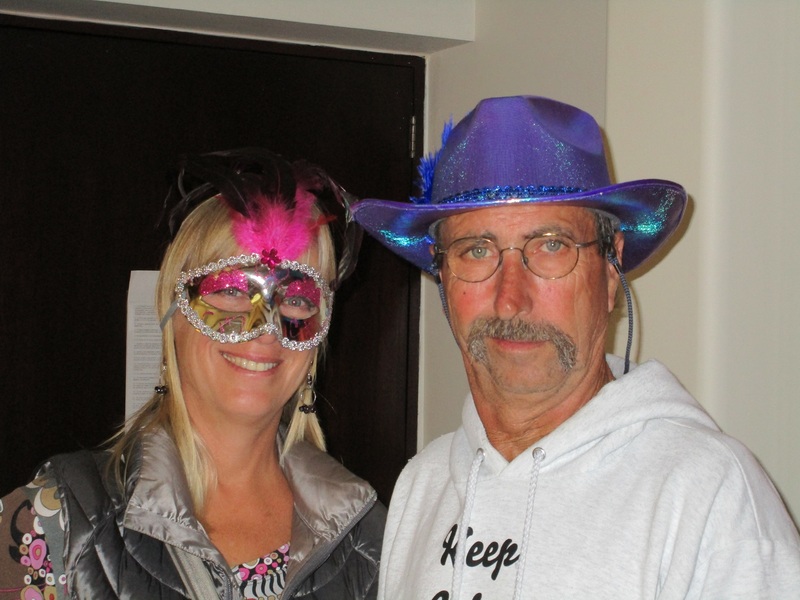 Dan and Tammy were able to get tickets for seating on a hotel balcony. Vacant lots lining the malecon were transformed into balconies, some engineer put a lot of thought into saving money and resources. 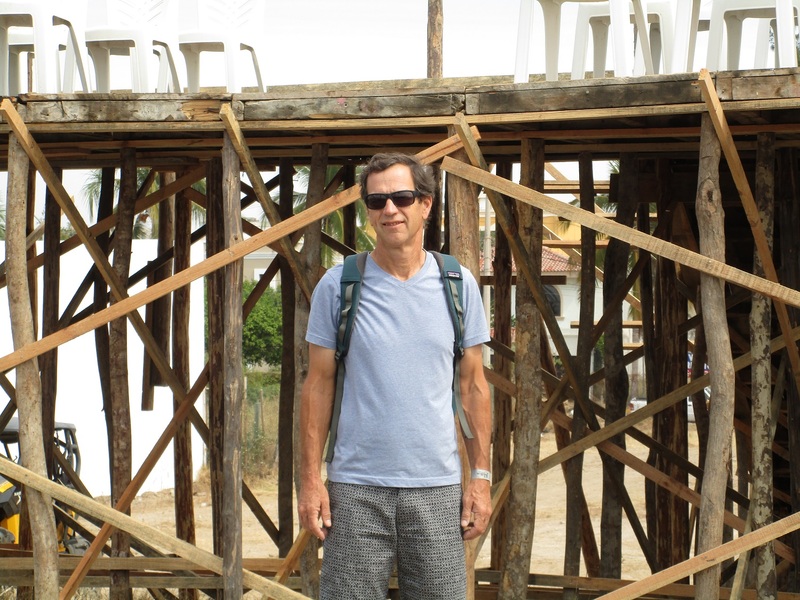 Platforms were built with old pallets, the supporting posts were tree limbs, and the cross “beams” were 1″ x 2″ boards all pounded in with shiny nails. The four lane highway was closed as the parade floats motored between 2 sets of bleachers and chairs. People were dancing in the streets along side some of the floats as the bands and music played. Some people brought step ladders to tower over the crowd. Try that in the U.S? We tried to estimate the number of people, 3 1/2 miles of people on the streets, sitting on rooftops and balconies, hotels suites – uncountable. The float displays were dazzling. The Carnaval queen’s float was most impressive. There was a float of prior years’ queens, some of them were close to 70 – 80 years old. 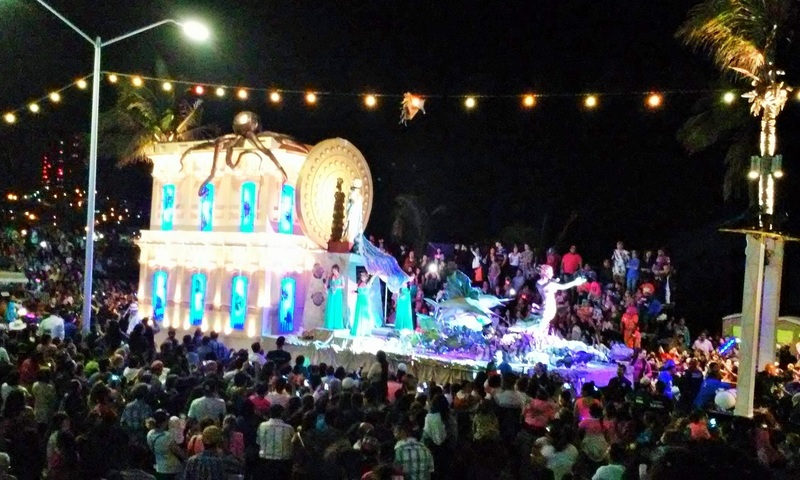 There were several Mexican company floats (sponsors of the Carnaval such as GasPasa, a Propane company not medicinal product) that had high powered stereo systems with skimpy costume dancers. There were Dance School floats and their students danced for miles dressed in beautiful flowing costumes. There was a float of speedo clad young men dancing to the beat of wild drum music, the crowd clapped and cheered. 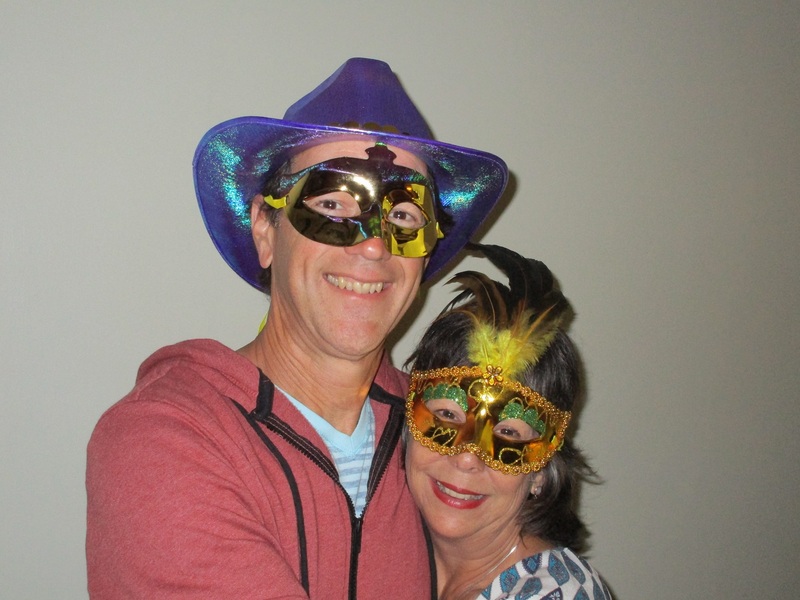 We spent the fun filled days walking the city of Mazatlan, dancing, eating and taking in the soul of Mexico with our best friends, Dan and Tammy. Another activity to add to your list of travels.